Sized for 2,500 Sq. Ft. 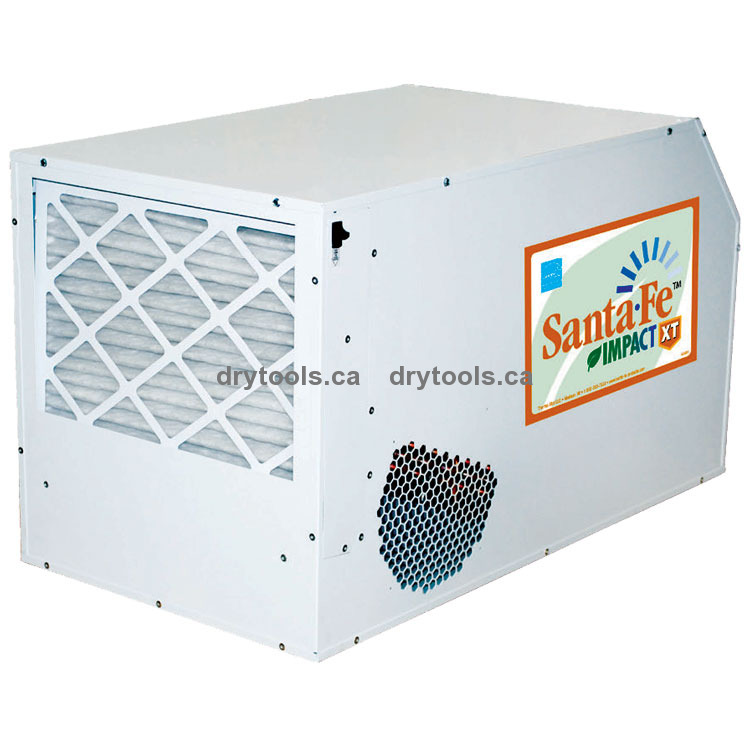 The Santa Fe Impact Dehumidifier (Impact 105) is specifically designed to dramatically impact the moisture in your crawlspace/basement, your energy bills and the environment. It is the most energy efficient dehumidifier on the market - exceeding Energy Star® standards by 50 percent. The Santa Fe Impact removes up to 105 pints of water a day while using an unprecedented 4.9 amps (8.8 pints per Kilowatt hour). It effectively dehumidifies up to 2,500 square feet and is the ideal free-standing dehumidifier for meeting aggressive energy use targets. The unit is engineered for extreme quiet operation and is optimized for low heat load. Optional condensate pump and ducting kits provide the installation flexibility necessary for the most challenging applications. High Efficiency – The MOST energy-efficient large capacity residential dehumidifier on the market. Low Temperature Operation – Engineered for the temperature and air flow issues that surface in crawlspaces and basements. When many conventional dehumidifiers have stopped removing water, the Santa Fe Impact continues to protect your family and your home. Superior Air Filtration – MERV-11 filtration is standard, capturing particles (including mold spores) down to 1 micron in size. This superior level of air filtration keeps the Impact working at peak efficiency while cleaning the air. Optional Equipment – Ducting kits and condensate pumps are available for use with the Santa Fe Impact. These optional kits provide the ultimate in flexibility for your specific installation requirements. Moisture Removal Capacity in litres per day at 27°C (80°F) and 60% Relative Humidity. Removal varies at other temperatures and moisture levels. Moisture Removal Capacity in pints per day at 80°F and 60% Relative Humidity. Removal varies at other temperatures and moisture levels. Temperature range the unit will function at. Unit will not remove moisture in temperatures below the operating range. Power draw in amps during normal operation of the unit. Unit may draw more power briefly during initial power up. Condensate Pump allows water removed from the unit to automatically be pumped thru tubing to a drain, even if drain is higher than unit. Without a condensate pump, water can only flow to a drain that is lower then the unit.